The position of the "Player 1&2 Wins" Should be centered, but except from that it looks good. 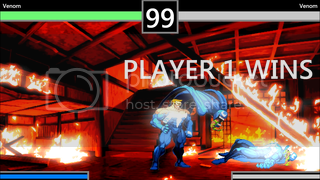 tbh.. its upto the designer/developer where to place the wins text.. maybe he has other plans for the rest of the screen like statistics and what not..
Mh you have a Point, I think i was to much into Mugen in my mind with that, where something like points,statistics,highscore are "Impossible to add because of differences in chars and stuff". 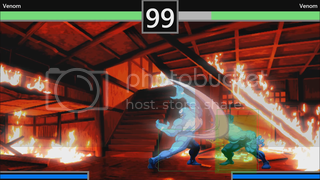 Why is there "1 HIT COMBO" when you hit just once? It's not a combo. It would be better if the "# HIT COMBO" started when you connected two attacks. 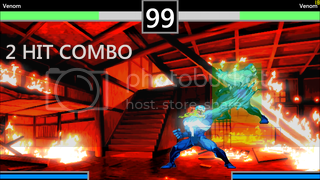 Also the combo detection is off: the character recovers yet he can be hit again and the number of hits in the combo increases. These demos are just there to show the basics of setting up specific game play systems in Fighter Creator, you could easily adjust it to work the way you want it to.